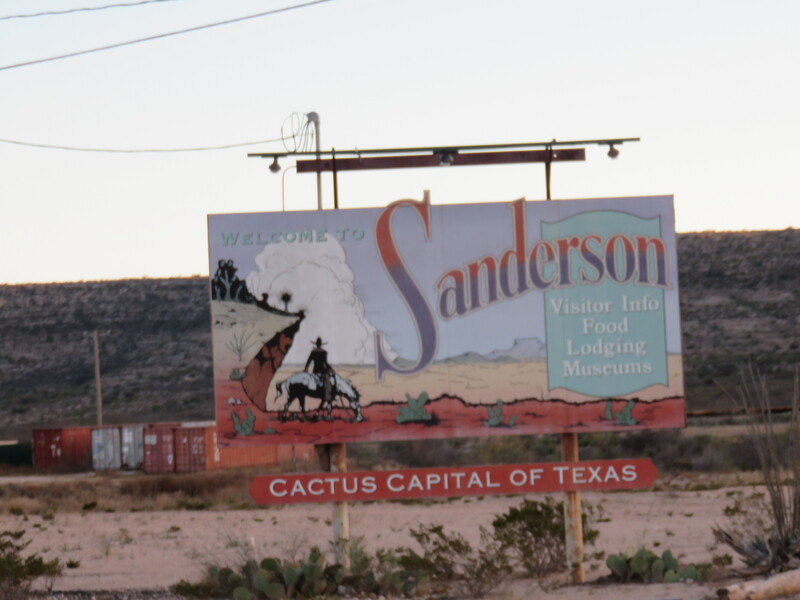 Riding through Sanderson, it seemed that, like most other small rural American towns in this area without a tourist industry, it was slowly dying. A lot of the businesses had closed down or were for sale and there was no market, super or otherwise, outside of the petrol stations. I was a little worried I’d struggle to feed myself if I couldn’t buy any proper food, as I was to stay here two nights to rest. I needn’t have troubled myself. To start with, Dilipseth, who runs the motel I stayed at provided free breakfast, lunch and dinner. This was a first at a place I’d stayed and made it great value. Of course I couldn’t expect Dilipseth to provide enough food to feed a hungry cyclist who’d been pounding out some very long days. Luckily I could supplement my calorie intake as there were a couple of small cafe restaurants nearby where I could awe the servers with my magical ability to make half pound burgers disappear with all their trimmings in about five seconds. While in Sanderson with a day to myself and the internet I was determined to book my onward flight from the USA. This was not at all easy. I wanted, ideally, to fly from Charleston to either Casablanca or Lisbon. In the end I couldn’t find a good value flight to either that didn’t present some issue from my travelling with a bike and a couple of checked bags. In the end I found a cheap flight from Miami to Madrid. Not ideal but it’ll do I hope. The next morning I woke a little earlier than necessary, confused by being in a new timezone and by being inside. This meant I got off very early before it was even starting to get light. This, coupled with an early fog, made it seem like I was riding outside of time as it took much longer than usual to get light. Once it was light I found myself grinding into a headwind and it took a while for me to reach the next town of any note: Langtry. 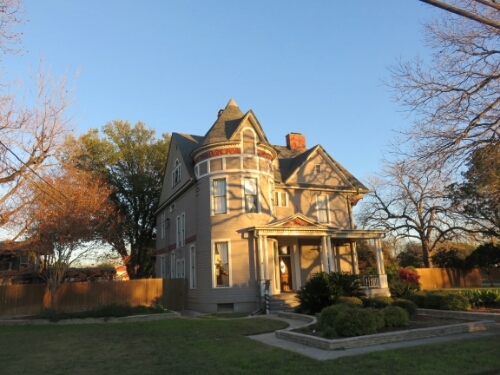 Langtry was of historical note only and like Sanderson seemed to be dying. 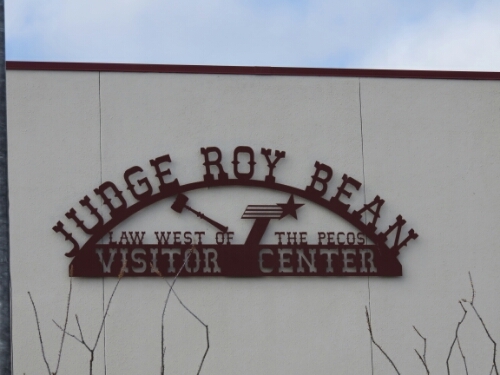 The town is famed as the base of Judge Roy Bean, the man known as the law west of the Pecos in the late nineteenth century. An apparently colourful figure he kept the peace with his pistol more than anything else. After Langtry there was not much of anything for quite a few more miles, other than the road I rode and the nearby train line. 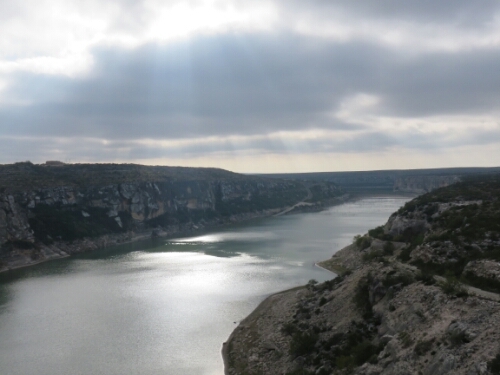 I eventually reached the Pecos River that Roy Bean had been the only law beyond. Now as you can see things are a bit more ordered with health and safety signs even. That night I’d ride until twilight finding a storm culvert to camp in. 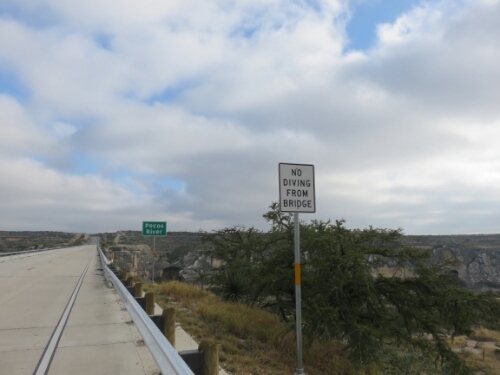 I was a bit nervous as I was close to the Mexican border still and there were a lot of border guards around. I’d even seen one checking a culvert similar to the one I was setting up in earlier in the day. I just had to hope they didn’t check them all every night. 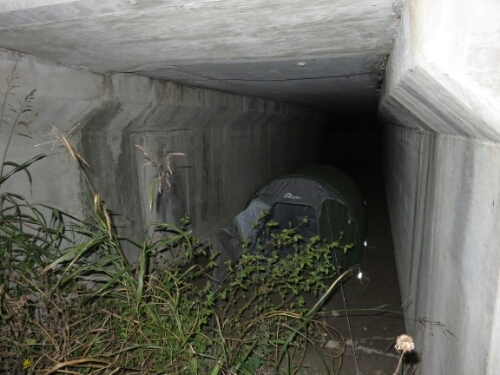 It was a strange place to camp as I was surrounded by concrete above and on both sides, barely wider than my tent. It was almost like being inside. I was obviously too comfy as I over slept by half an hour. 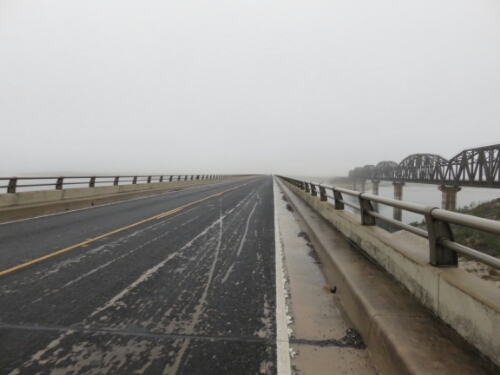 The next morning was really foggy again, which meant I missed out on the full spectacle of crossing the Amistad reservoir on one of the trip’s longer bridges. 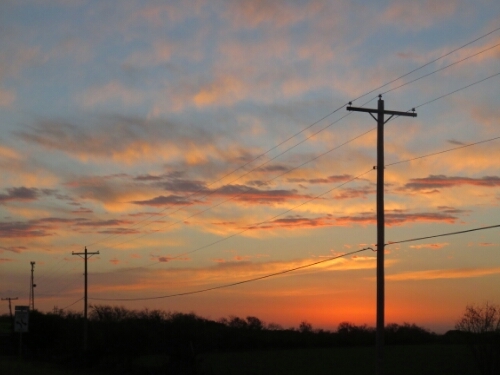 The rest of the day was fairly standard for Texas. Long seemingly never ending roads with beautiful but slow changing scenery. I thus got a fair amount of reading in. 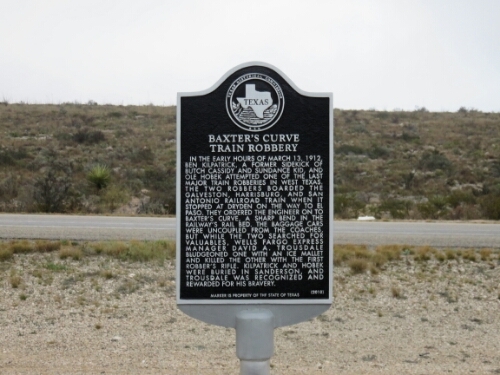 After Del Rio, the first sizeable town I’d passed through since El Paso over 400 miles ago, I started heading more directly east. The landscape gradually changed, more trees appeared. I realised I’d been passing through desert or desert like areas for too long as I thought to myself ‘wow, a tree’ when I saw the first. 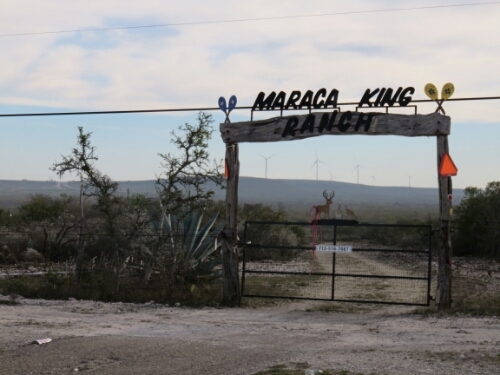 There were also more ranches lining the road. Many of which advertised hunting, sometimes of exotic animals. The only ones I saw were deer, some small with upright white tails that were like flags of surrender flicking as they skipped away, startled by my bicycle. 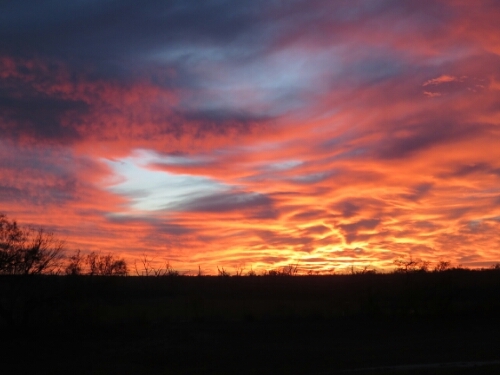 The day drew to a close with an incredible sunset, the whole sky was lit up with fiery colours from horizon to horizon. I almost fell off my bicycle trying to take it all in. That night I would also pass through my first checkpoint since communist China; where American border patrol officers were checking for drugs and “aliens”. Luckily I had none of the former and was a legal one of the latter. ‘Nope, English’ Guessing games when the light is fading are not a good idea. Passing through I looked for somewhere to camp, keen to find somewhere similar to the night before, in a storm culvert under the road. After a short while I did and I laid my bike by the road as I went to check it out. Not as good as previously as there was no mud over the concrete for me to peg my tent in. 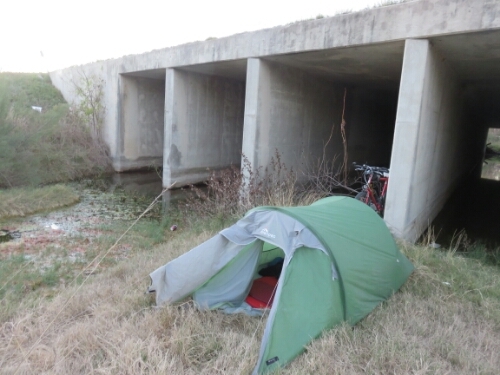 There was room in front of the culvert though and so I brought my bike down and began setting up my camp. Then a car pulled up and I wondered why they had stopped, I switched my headlamp off on the assumption they weren’t looking for me. As you can imagine a few thoughts went through my head, mostly after my hands went up like rockets. The Sheriff’s officer, for that is who had discovered me, then asked what I was doing. I explained truthfully and he fairly quickly realised I wasn’t a threat and said I didn’t need to keep my hands up. I think we were both a bit embarrassed about that as they’d been up a while. Then a Deputy turned up and they conferred and agreed they didn’t have any problem with me staying there that night. They’d only found me because someone had phoned in that they had seen my bicycle lying by the road and thought there might have been an accident. Both officers were very nice and the one who had pointed his gun at me earlier made it clear they were there to check on my welfare. They ran my details through the system (‘I’m going to run him’, like in the movies I thought again) turning up who knows what but nothing interesting. They then decided I’d probably be safe where I was. ‘No one will even know you are here.’ The deputy remarked as they left. Which was the idea I thought to myself. I got up and out early in case they decided to check I’d moved on and was treated to a beautiful sunrise to match last night’s sunset. Shortly after this the day started to go downhill when a dog began chasing me. I hadn’t been chased by dogs too much since central Asia and my dog avoidance reflexes must have been rusty. Normally I just put my head down and outrun them but this dog wasn’t having any of it and actually clamped its jaws on my rear panniers! 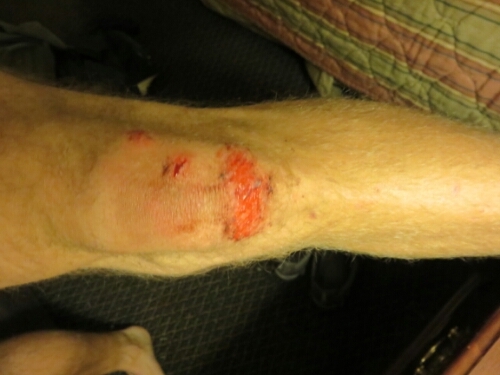 This was the first time that had happened the whole trip and it was very unnerving as it could have been my leg. The dog didn’t hang on long luckily and I managed to lose it with no damage. Then the wind began. A strong continuous blast from the north that made going hard and very very chilly. I’d planned on reaching San Antonio that evening but now I thought it’d be better to get as close as possible and camp. Then I could ride into the city in the morning. 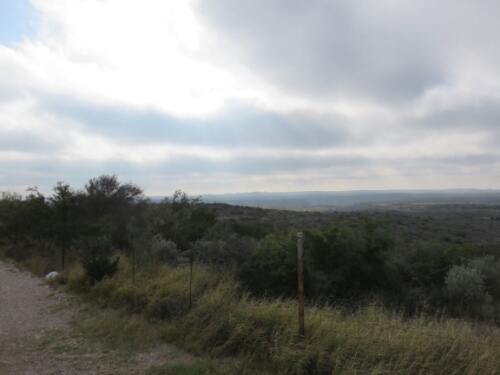 So I rode on through central Texas, which is a lot greener and more populated than the west. It would have been pleasant but for the wind, which made it a grind. 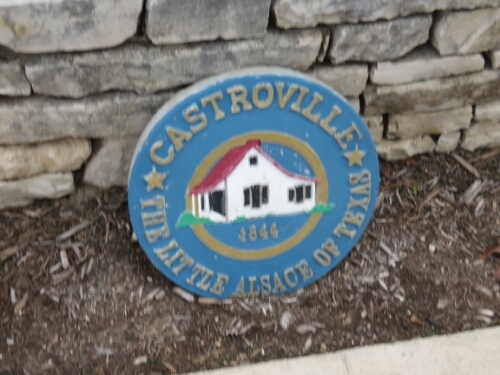 That afternoon I reached another Castroville, the first I’d passed through, in California had been the artichoke capital of the world. 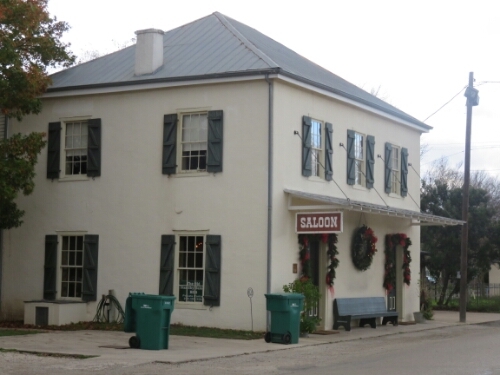 The Texan Castroville was simply the little Alsace of Texas. Apparently a lot of people from Alsace had settled there influencing the architecture and cooking. It was certainly a pretty little town parts. 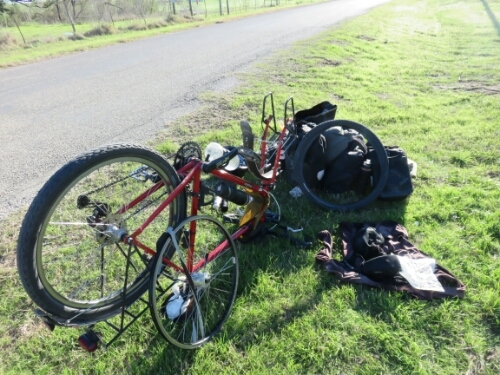 After riding a few miles out of Castroville I decided to camp, so that I wouldn’t hit San Antonio’s urban area. I managed to find a good spot next to a concrete bridge over a polluted stream running under the highway. I was still getting used to camping on soft grass again after all the rocky pitches. It was also the first time in a while I’d camped before sunset. The next day was Christmas Eve and I remembered where I was this time last year: riding into another Uzbek desert in the freezing cold. Today I was riding into a large American city to see the Alamo. The day didn’t start well with some idiot shouting from his car that I should ride on the sidewalk. 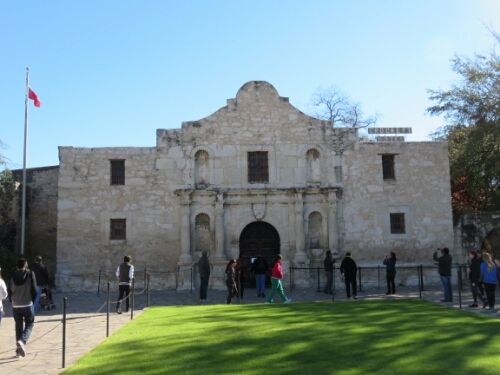 I found the Alamo without too much trouble but it was closed for Christmas already. Apparently there isn’t much left of it anyway, the Mexicans really kicked some Texan arse, so I was happy seeing the outside. Downtown San Antonio was quite nice and surprisingly easy to get out of. 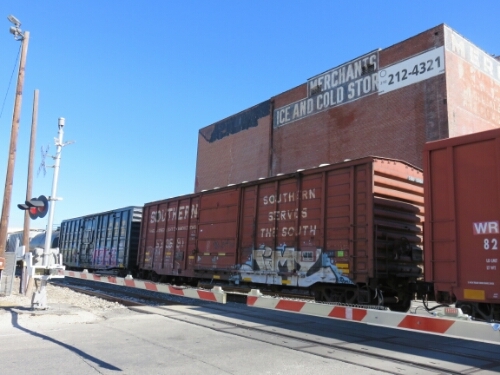 Apart from when I had to wait twenty minutes for a couple of huge American trains to pass. 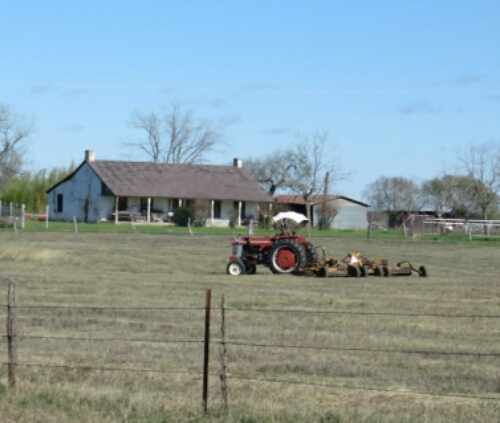 On the other side of San Antonio the land seemed to grow even more green and more land seemed to be farmed. 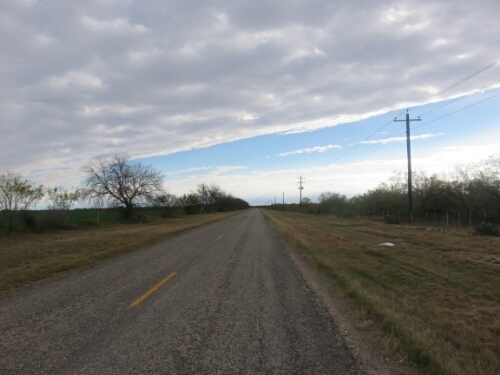 This is probably an illusion though and the change was gradual since I started heading out of west Texas. 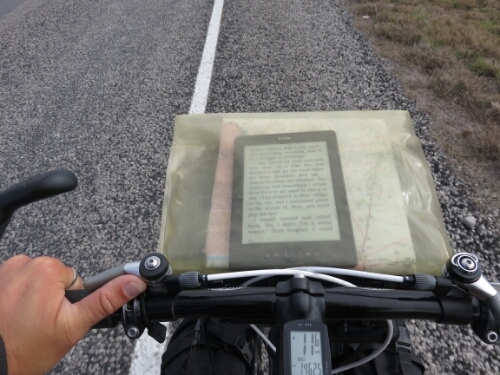 I was rolling along quiet country roads following Google’s cycling directions that kept me off the highway. It was very peaceful. Until barking rent the air and dogs started chasing me. Out here not all owners seemed to feel it necessary to restrain their canine friends. 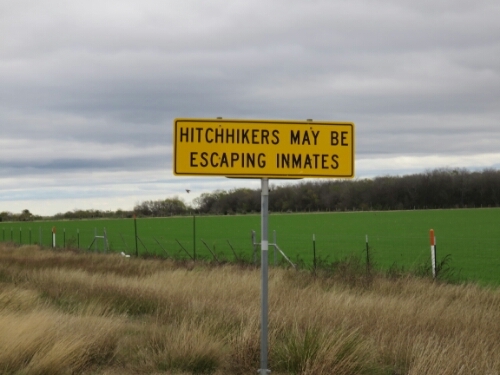 I was being chased by big dogs, little dogs, basically any dog that was free to chase me down the road. As soon as I outran one set I’d pass another farm and it’d begin again. Something about the bicycle drives dogs wild. Even a couple of Lassie lookalike collies were reduced to slavering beasts only held at bay by a fence. Then I came round a corner and as I was passing one property I saw a huge pit bull spot me and begin its charge. I did not want that dog anywhere near me so I started to speed up. Unfortunately the dog mistimed its run and went straight into my front wheel. After that I’m not sure what happened, until I started sliding along the floor for what felt like five metres but was probably less than one. When I stopped I was on my back looking at the dog. I think luckily we were both dazed because the owner ran over and grabbed the dog before it could work out what to do. I just stood up and tried to get my breath back and avoid checking if my bike was OK as long as possible. I had a feeling I hadn’t gotten away with the crash without some damage. The owners, luckily, were not standoffish and tried to make sure I was OK. In situations like that it’s easy for both sides to get angry irrespective of fault. I imagine injuring someone in America’s litigious culture can be quite frightening. Thankfully I was just grazed and a bit scraped and the owners offered to help. The dog seemed to be OK too. My bike also, had merely broken a spoke. This was a bit worrying for me as I had never had it happen before and didn’t actually know how to change one. Fortunately I had spare spokes with me and a bike repair app and I managed to fix it. Hopefully it’ll hold! 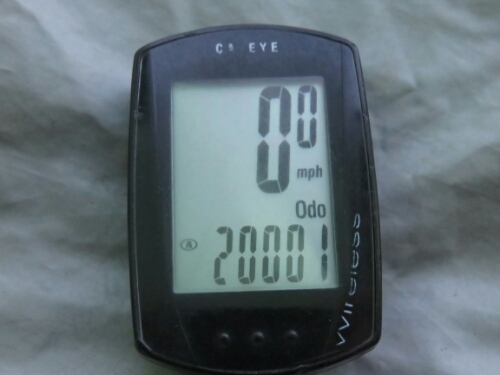 20,000 miles without a broken spoke was pretty good going! I’ll be happy if that is the last. 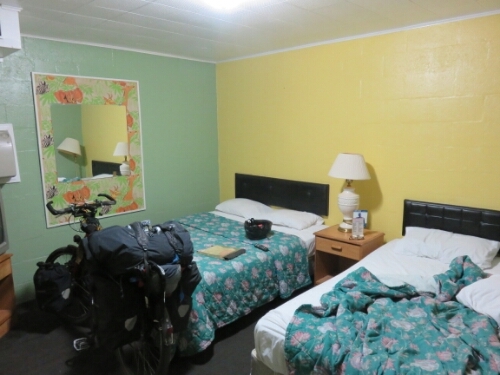 After I’d repaired the spoke and the lady who owned the dog had patched my scrapes up I decided to head to the next town and find a motel. I’d originally planned on camping but thought seeing it was Christmas Eve I would take my rest day early. I was feeling a bit beaten up as well and didn’t want to be in my tent by the road if I woke up with a knee that wouldn’t bend. So I made it into Seguin and had a look for a motel. Eventually I found an America’s Best Value Inn, which ironically was probably the worst value place I’ve stayed the whole trip. Merry Christmas Adam. Hope you get a good meal tonight and rest that knee. Love your updates and insights. Yes, in America we have huge trains!.